The First Lady, Mrs Rebecca Akufo-Addo, on Tuesday accepted, formally, her appointment as the Patron of the SOS Children's Villages in Ghana, conferred on her by the SOS Board. 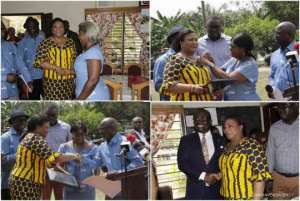 The SOS Board presented a certificate to the First Lady to that effect at a short ceremony at the SOS Tema Community Six Children's Village. 'I formally accept to be a Patron of SOS Children's Villages, Ghana. After all we share the same heartbeat, where vulnerable children are concerned,' Mrs Akufo-Addo said. She said; 'My work with children is my life's passion,' adding that her two Foundations; the Rebecca Foundation and the Infanta Malaria Prevention Foundation, which she co-founded, had provided her with the structure and focus to do even more for children. 'In the course of my work I have seen pain, dejection, neglect and gross abuse of children. But then again, I have seen hope, joy, recovery and a second chance given to a child because somebody stood to make a difference in the life of that child,' Mrs Akufo-Addo said. The First Lady indicated that her experience had made her a firm believer in the adage that; 'It takes a village to raise a child' and 'A village that raises good children becomes a great village'. She, therefore, commended SOS Children's Villages all over the world for providing a home and an enviable education for the countless children. She thanked the Board, Management, staff, and the mothers for their selfless dedication to the cause of children and encouraged the children to learn hard, be diligent, believe in themselves, live their dreams and 'live them big'. Mrs Akufo-Addo entreated all to do whatever was needed to help raise great children because the country would be made great by these great children, making it a 'win for us all'. She called for 'innovative, sustainable and diverse means to support the care and education of the children as it was becoming more difficult globally to fund charities and institutions like the SOS Children's Villages.